Mustek MP80D review | What Hi-Fi? Great spec and biggish screen are intriguing, but performance is nothing special. Does the combination of small children and long car journeys fill you with dread? This could be the way to distract your little dears from arguing, fighting and asking ‘are we there yet?' 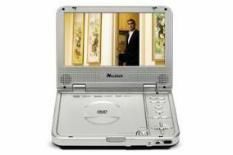 every half-mile – it's a portable DVD player and screen with digital TV, too. The MP80D (the ‘8' refers to the screen size, in inches) can be powered by mains, battery or 12v ‘cigarette lighter' adapter. There are speakers (thin, sibilant and breathless-sounding), and there's a headphone socket, too (which curbs the shriller excesses), so it shouldn't be hard to find a configuration that'll make Junior's journey (and yours) a bit easier. By the standards of the best rivals, pictures are mediocre. DVDs are colourful and vibrant, but motion – of any severity – is tracked uncertainly and black tones lack any detail. There's also a surprisingly confined ‘sweet spot' in front of the screen, too. The TV tuner picks up many stations in quite short order, but adds a great deal of blocking and digital noise to those existing motion and detail problems. Many of this Mustek's portable DVD rivals might not boast a TV, but they're still more fun to watch.